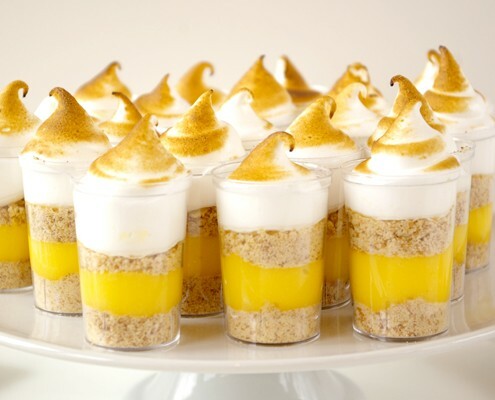 Homemade lemon curd and italian meringue are two quick and simple components that combine with store-bought vanilla cookies to make this delicious two-bite dessert. Combine the egg yolks, sugar, butter, lemon zest and juice in a medium stainless sleet or glass bowl, and set over a saucepan of barely simmering water. Whisk constantly until lemon curd thickens and reaches 175 degrees F.
Remove from heat and let cool, whisking every few minutes to aid cooling. Cover with plastic wrap so the plastic touches the surface of the curd and chill for a few hours or overnight, the curd will continue to set up as it chills. This can be made in advance, you can store it in the refrigerator for 1-2 weeks or freeze. Cook the sugar and water together in a small saucepan over high heat until it comes up to 243 degrees F.
When the mixture reaches about 230-235 F, begin whipping the egg whites in a stand mixer on medium-low speed until they are foamy. When the sugar reaches 243 degrees F, remove from heat, and pour very slowly in a steady stream into the whipping egg whites. As soon as all the sugar is incorporated, turn the mixer onto high, and whip until completely cool. Place a small amount of crushed cookie into the bottom of each shot glass. Transfer your lemon curd to a pastry bag and pipe a small amount into each glass. Top each glass with more crushed cookies. Transfer your meringue into a pastry bag fitted with a large plain tip and pipe a big dollop on top of each shot glass. Using a kitchen torch, carefully toast each meringue top until they are golden brown. If you are using plastic shot glasses, be mindful just to toast the tops of the meringues, otherwise you run the risk of melting the plastic. Bria Helgerson is a Chicago based food blogger and pastry school student. Lover of all things sweet and savory, she cooks, bakes, and blogs as she navigates her culinary life at her website These Peas Are Hollow.